April has been an eventful month for Architecture of a Mom. I kind of feel like I’ve become a real blogger. Oh, the changes aren’t significant. You probably haven’t even noticed. But I’m excited, okay? Humor me a little while I share the changes! First, I went from having a blogspot URL to a “vanity” url. In fact, if you have been using your old shortcuts, you may have still been using the blogspot address…but it magically changes to www.architectureofamom.com –which is pretty cool in my mind. And then, I went and got real business cards. Yup, I feel really official now. Good thing, too, since I’m going to my very first blog conference next month. I’m looking forward to learning a lot, but I needed some cards so people can remember me! I also shared my very first series about Disney projects. I have shared 4 neat DIY projects like these hair clips and these water bottles that will make our trip to Disney World a little cuter, I think...and I have more to come! If you are heading to Walt Disney World or Disneyland, I think you want to check them out! 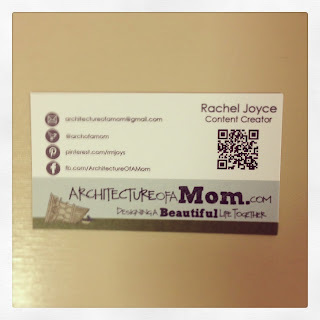 Thanks so much to all of you who come by and check Architecture of a Mom out. You rock!